Don't neglect your clock!!. Call Tim Today to set up your clock's routine cleaning and maintance!! Call Tim about today's specials!!! 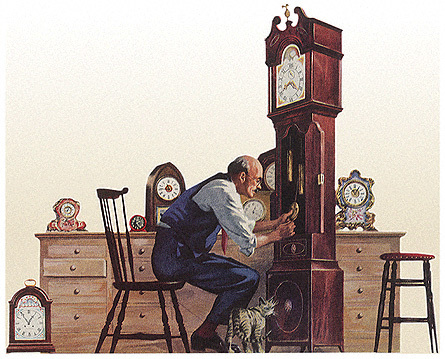 Sales & Service of new and antique clocks from Howard Miller, Ridgeway ,Sligh, and others. We Specialize in Grand Father clocks. We also sell collectable light houses, Executive gift sets, and more. MOVING? call us to move and professionally set up your grand father clock. Copyright © 1999 - 2004 The Clock Master. All rights reserved.